Astro was found wandering the streets of Austin, Texas, around 10 months ago, and was taken in by Austin Pets Alive. 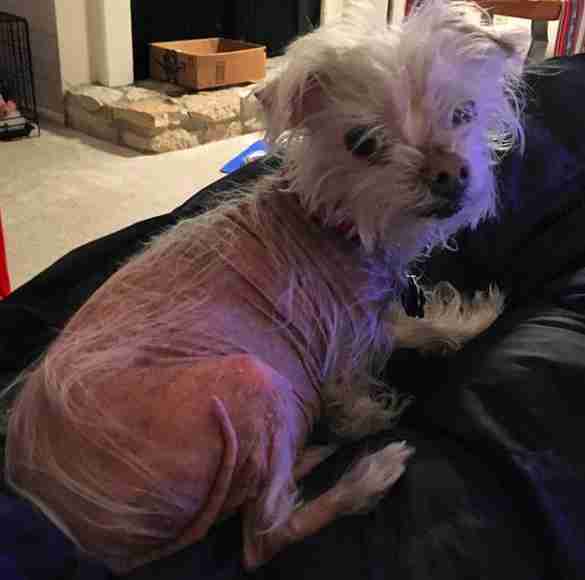 When he was found, the little 12-year-old dog was almost completely bald and covered in some sort of skin infection, and his toenails had grown so long it was impossible for him to walk without feeling intense pain. He clearly had a lot of issues to work through and his rescuers knew it could be hard to find a family for him — but the right people ended up finding him much sooner than anyone expected. 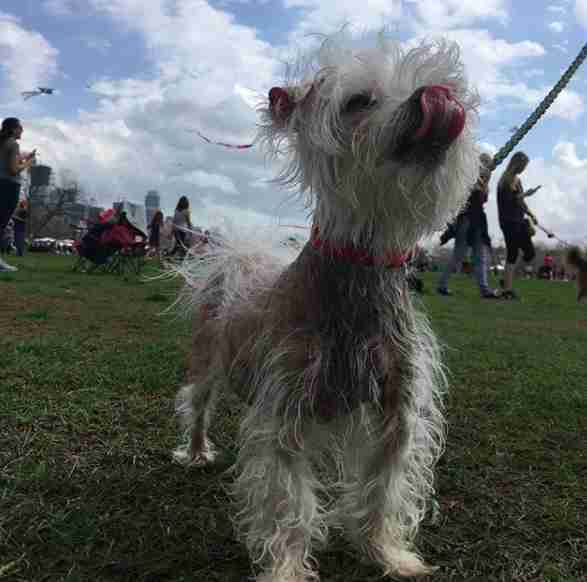 Not long after Astro arrived at the rescue, Katie Kalk found out about him and decided that she and her husband would foster him for a little while. Astro was incredibly nervous and scared after everything he’d been through, but the couple knew that all he needed was a loving home and a second chance. “The moment I picked Astro up he licked my face and I knew that I had to take him home,” Kalk told The Dodo. 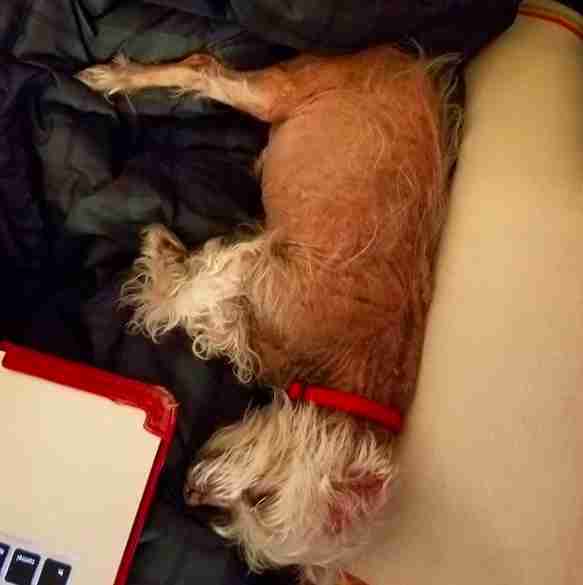 When Astro first arrived in his foster home, he was incredibly shy and lethargic. 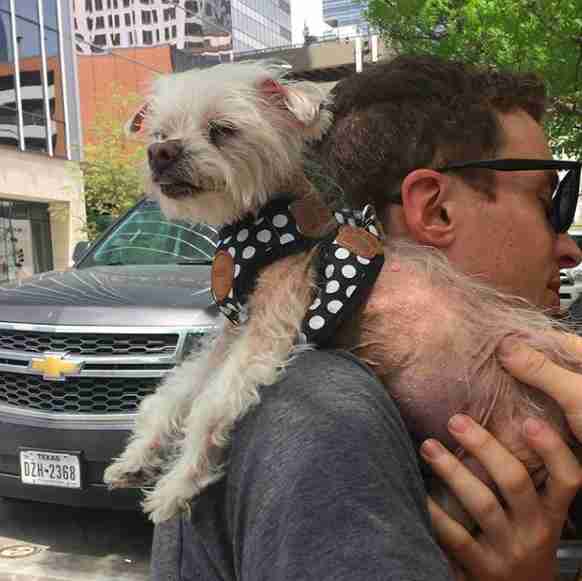 He hated leaving his crate — and when he did, he never sought affection from his foster parents. He kept to himself, and was so terrified of loud noises that when he heard them he would run right back into his crate and stay there for hours. The couple did what they could for him, and hoped his forever family would be able to do more — but then Hurricane Harvey came. After Hurricane Harvey hit, Austin Pets Alive was overwhelmed with animals, and the couple ended up having to foster Astro for much longer than they’d originally anticipated. During that time, despite his numerous issues, they ended up falling completely in love with the tiny bald dog, and decided to officially adopt him into their family. Astro is far from a “traditional” dog and had countless issues to overcome when he was first adopted, but his new parents decided they were up for the challenge, and quickly set about trying to help him on his journey to recovery. 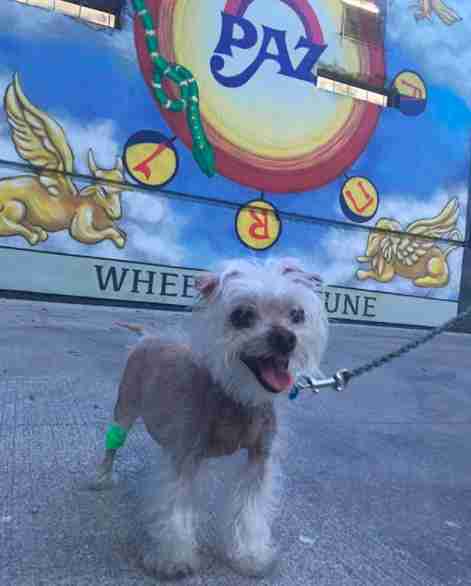 Astro’s parents knew that the first hurdle they needed to overcome was his medical issues. They hoped that if they could conquer some of those, Astro would start to warm up a little more and become less nervous. After spending extensive time with a vet, Astro was diagnosed with Cushing’s syndrome, a condition caused by a small tumor in his brain. The tumor triggered his adrenal gland to make too much cortisol, causing skin and bloating issues, and lots of stress. 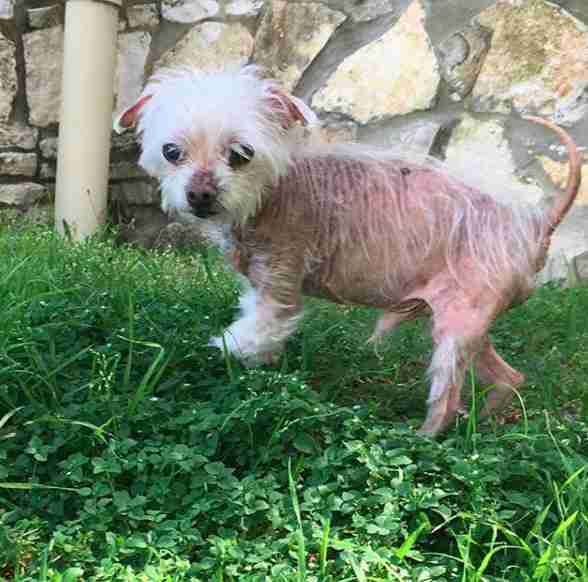 Astro was also diagnosed with hypothyroidism, which is what caused his hair loss. 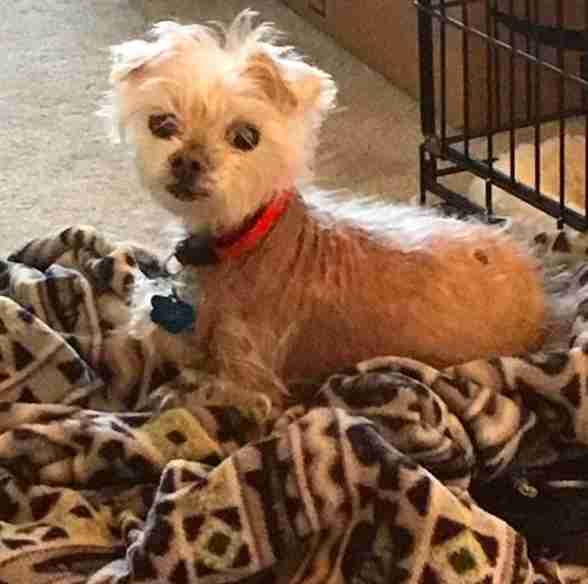 The Kalks quickly started Astro on treatments for both diseases — and slowly but surely, little Astro began to morph into a completely different dog. Once Astro started to feel a little better, he began to open up to his new parents more and more each day. He’ll always be a little more on the nervous side, and it’s impossible to know what happened in his past to make him that way, but his family has so much patience and are more than willing to love him through it all. While his medical issues are being controlled as best as possible, Astro’s fur still hasn’t really grown back, and it probably never will. His parents love their adorable little bald dog, though, and have lots of sweaters and outfits for him to wear when he gets too cold. Astro no doubt had a very hard life during his first 12 years, but now he has the best family, who are willing to do absolutely anything to make his golden years as comfortable and as happy as possible. You can follow Astro and all of his adventures on his Instagram account.